I decided to look like a Final Fantasy character and no one stopped me! I'm still getting used to it, there are times when I do a double take when I see my reflection. I'm not one to shy away from hair experimentation. I've gotten a turquoise balayage, multi-coloured highlights, a red tint and even went a little blonde. But the one look I'd never gone for was a complete hair transformation. I had my reasons, which included the amount of damage my hair would suffer to achieve such a look and of course the ever famous log kya kahenge. So obviously, I had to do it. And I decided to go rose gold. This is what my hair looked like from my last makeover. 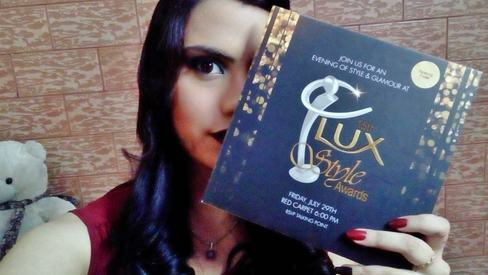 I still had dark locks with dark blonde strands here and there. I ran the rose gold idea by everyone I knew, thinking if even one person said it was a bad idea to look like a Final Fantasy character I wouldn't go for it. But to my dismay, I'm surrounded by very supportive friends and family... who usually see me as tribute and want me to try something before they go for it themselves. Thanks fam. It's when I did my research that I realised salons have different ways to give you the look you want with minimum damage that my decision became final and I made an appointment with my stylist. 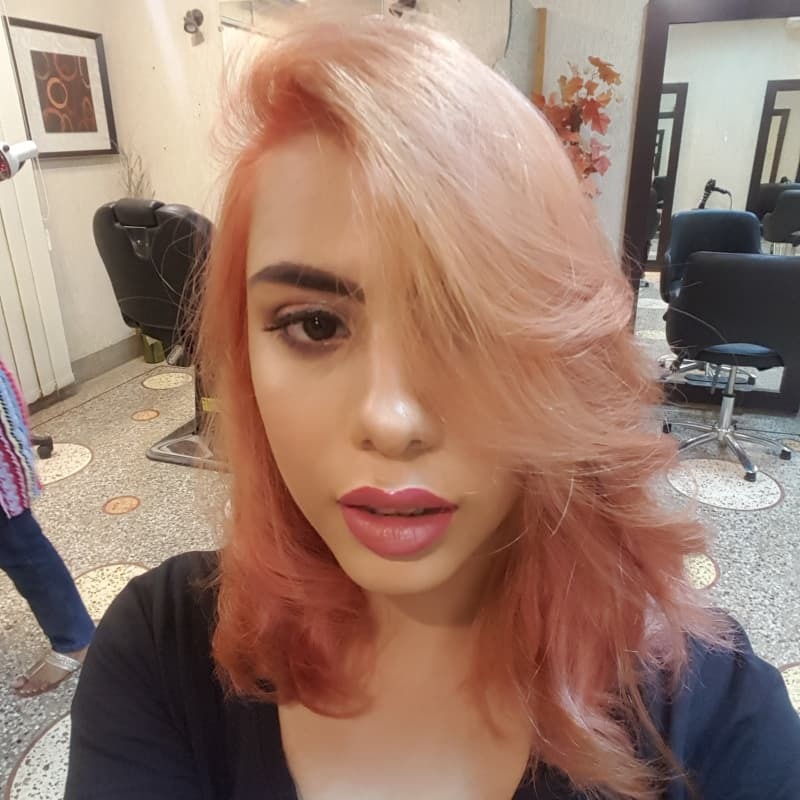 Mehnaz, my hair stylist from salon Trims n Tresses, was more excited than I to try out the rose gold look. "I've learned all these looks and have been waiting for someone to go for it all this time!" she exclaimed. I knew I was in good hands but still had my doubts. Who doesn't when it comes to hair? Sure I wanted a new look but what if the very look I expected to make me look fantastical made me look like a troll doll instead? Worst case scenarios went through my head, ranging from people laughing at me to me losing my job. But I was already at the salon by then and I'm a woman of my word so there was no turning back now! My hair was dark and to achieve rose gold I needed to lighten my hair. This was the part I was worried about. Bleach has a bad reputation and for good reason. When it strips your hair of pigment it dries your hair out and can leave it brassy and brittle. But it's 2018 and the hair care industry knows what we want; pretty hair with the least amount of damage. 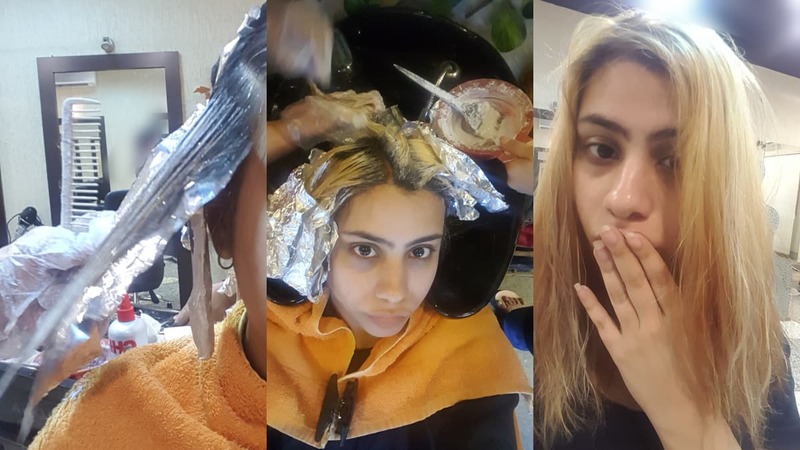 Mehnaz deals with L'Oreal's Smartbond, which is Olaplex's long lost (and denounced) cousin. Smartbond works on repairing your hair during the bleaching process so the end result is lightened and soft locks. Like I said my hair was dark, and moody. A simple bleach process was not enough to get rid of the pigment that my strands possessed. 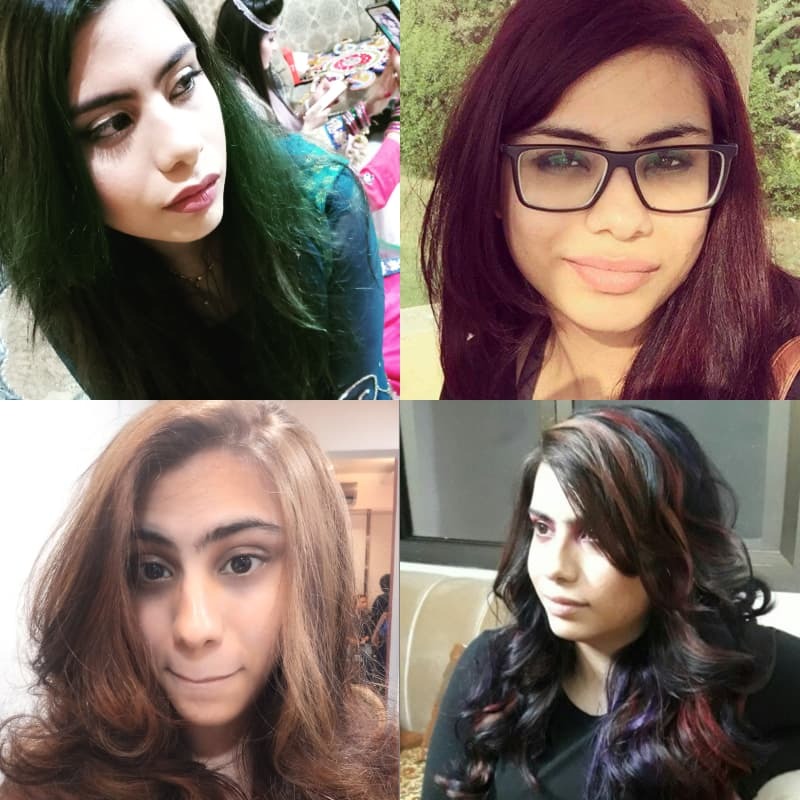 I felt a little disheartened when Mehnaz checked my hair and spoke about my hair lightening at a slower rate. I worried, would I not get the look I wanted? But my stylist had more faith than I did and knew what was needed. An extra dose with some extra heat. 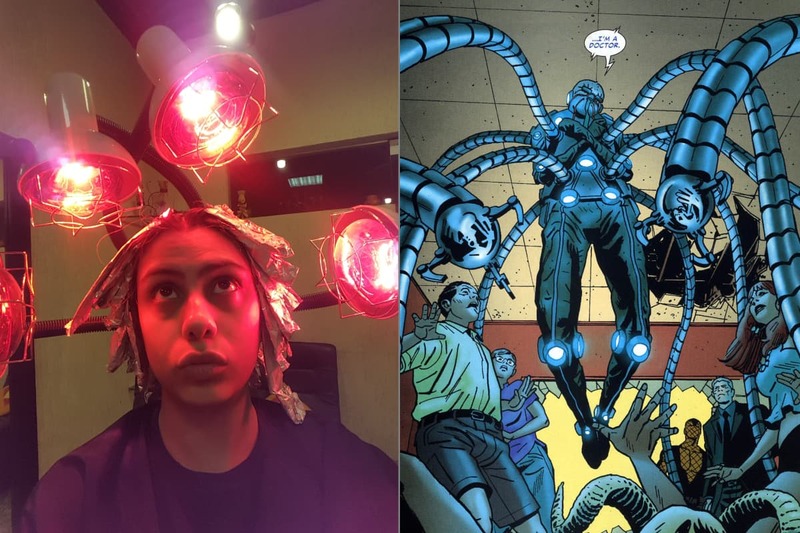 I was seated in a contraption that looked straight out of a sci-fi movie which provided an even distribution of heat to my hair, encouraging the lightening process. This was the time when the panic set it. I'd seen enough hair disaster videos (why do I do this to myself?) to know about all the possible ways my hair would suffer. It would get fried, it would turn into straw or it could just fall off! I had visuals of washing my hair and strands just falling till I looked like a baby pigeon. I took deep breaths and tried to distract myself by comparing the heat machine to different bots and creations from comics. Dr Octavius was the closest win. After a decent amount of time it was time to wash out the solution. I tried to relax and mentally prepared myself for the life I'd lead if I ended up with the baby pigeon result. 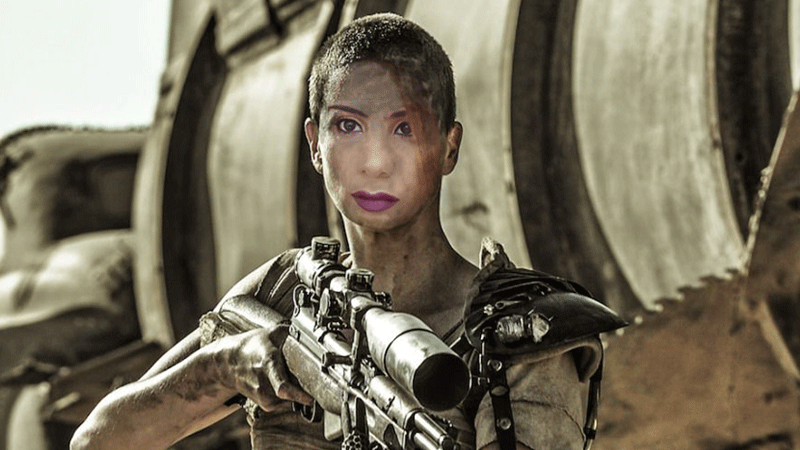 I'd just tell people I was inspired by Mad Max's Imperator Furiosa. She's awesome. Will this be my life? While my hair was being washed, a neutraliser was applied to counter any orange-y tones caused by the bleach and to remove any brassy notes. The neutraliser is different from a proper toner as it still leaves your hair porous to absorb the pigment from any dye. The result was a very very blond me. I was taken aback when I saw the very light hair. The mixture of fear and excitement grew as I realised this halfway point was only the beginning for me. After feeling my hair and seeing that the Smartbond worked, I was confident about my hair surviving the extreme styling and instead of panicking about shaving my head off, I started seeing myself as blonde characters from video games and other Charlize Theron characters while Mehnaz prepped round one of the rose gold. That's right. Round one. 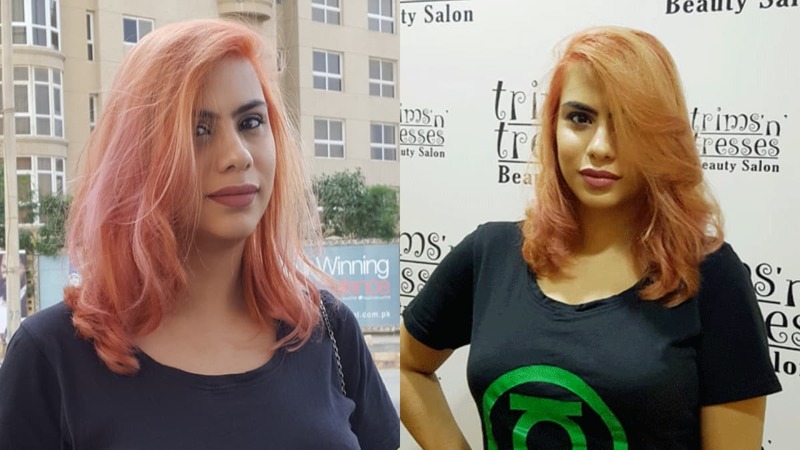 Round one of rose gold had some extra lifting of the pigment and gave a singular coral tone to my hair, this was the foundation Mehnaz set so she could add transitions to give the right dimension to my hair. 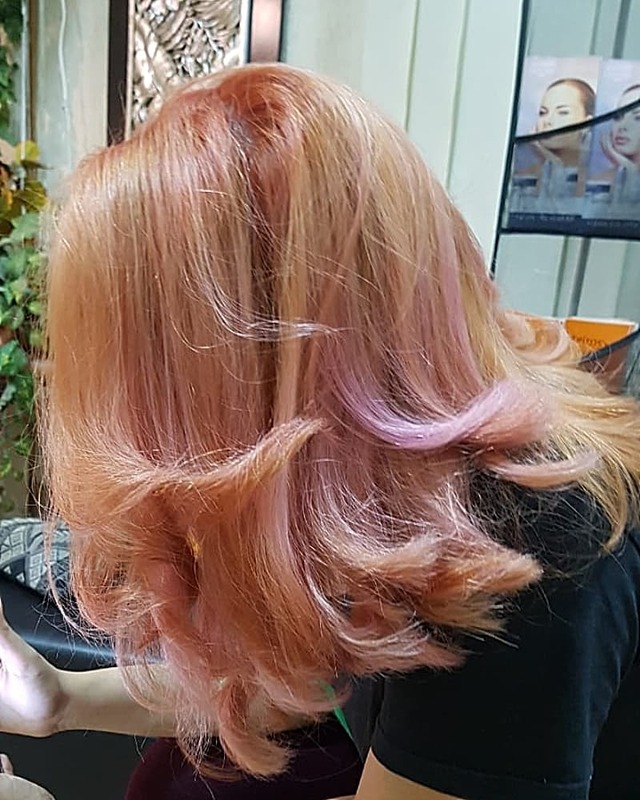 Round two was adding transition shades and different hue tones, like pastels and violet hues so that the extreme look would still blend softly and flow well. This means I was about to have various shades and tones in my hair. 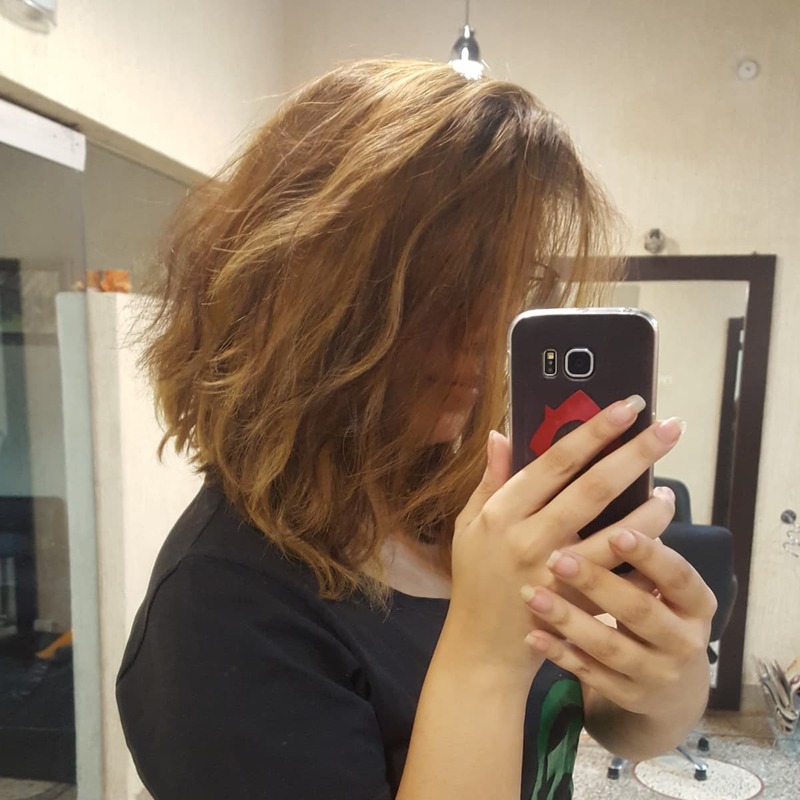 By this time I had been in the salon from noon to evening, my legs had fallen asleep multiple times and I was exhausted from sitting too long. I was admiring Mehnaz for having been on her feet the entire time, catering to me and other customers. 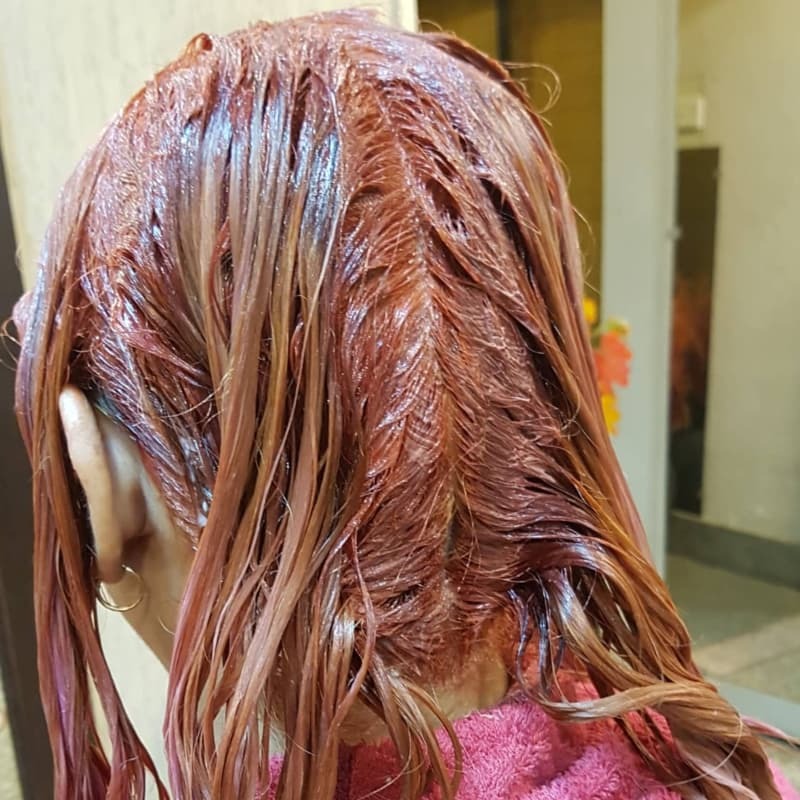 It was finally time for the last wash. With it Mehnaz applied the final treatment to repair any damage to my hair which may have been missed before. The cuticles were sealed and with it the colour. Time to wake up and smell the rose gold! I saw the final look and took a breath of relief because I got the right look! My hair had beautiful hues of rose gold which would look amazing when I ruffled my hair in the light. And boy was it soft! I couldn't resist running my fingers through my hair and shuffling it around to see the multi-dimensional look that was coming through. Call me the rose gold Iphone! "I'm gonna wake up like this!" I hugged Mehnaz and headed home to show my mother who loved it more than I did - which I can't deny was a breath of relief. Walking out the next day I was happy to receive compliments not just from friends and family but from strangers as well. One woman stopped me and had a heart to heart about my hair which made my day. I love women complimenting and supporting other women and to have been on the receiving end of that was the best feeling of all. Thank you kind lady at Lucky One mall last weekend! How it looks outdoors vs indoors. I'm surprised at myself for going for this look at all, I never thought I could do something this extreme, but seeing how people reacted to it, seeing it wasn't treated with any hate or judgement and only admiration, I'm willing to do it again and hope many who are unsure about trying out such looks also go for it. It's been over a week and my hair is still soft and bright as ever. That's the mark of a good dye job. I have a gentle shampoo and conditioner which is made for colour care and I got my hands on an at-home treatment to prevent any future dryness - which hasn't happened yet. I'm still getting used to it, there are times when I do a double take when I see my reflection. But there are no regrets. Just future plans for more looks. I also take requests! If you are happy, good. As for onlookers, beauty lies in eyes of beholder. This coloring should be done ,by people that afford it! If your natural hair looks great ,stay away from chemical treatments ! Best advice given,by people that know about this subject! My cousin the beautician ! You look good! Anyway, it is not my call, if you are happy then that is all that matter. Looks retro more like an 80’s punk look suzie and the banshee without the banshee would have been better cut short Ann Lenox style or better still spiked up with a can of gorilla glue sid viscous style. But innovators are those that mold society whilst the rest of us for a shearing the lady isn’t a ba!ba! sheep but a grr! grr! Tigress more power to her.